On the same day that Betsy DeVos spoke to her staff as the new head of the United States Department of Education, a member of Congress from Kentucky who spent years living off the grid with his family and is a favorite of the Tea Party has introduced a bill to eliminate the department altogether. H.R. 899, introduced by U.S. Congressman Thomas Massie (R-KY), is a single sentence long: "The Department of Education shall terminate on December 31, 2018." The bill already has support by seven co-sponsors: Representatives Justin Amash (R-MI), Andy Biggs (R-AZ), Jason Chaffetz (R-UT), Matt Gaetz (R-FL), Jody Hice (R-GA), Walter Jones (R-NC) and Raul Labrador (R-ID). In an interview with conservative network TheBlaze, Massie said that he introduced the bill while the Senate was voting on DeVos' confirmation. "Look, the Department of Education doesn’t have a single school room and it doesn't have a single teacher teaching anything there," he told the interviewer. "What it has is 4,500 bureaucrats making an average salary of $105,000 apiece each year, dictating to states what the students there will learn and how they will learn it. But in terms of funding, it makes up less than 10 percent of our nation's primary and secondary school funding." In some states, he added, it's as little as 4 percent of the funding. "I'm not saying to cut funding for students and teachers. I'm saying there will be more funding -- and it will be spent more wisely if you leave it in the states instead of taking it to Washington, D.C. and creating these lifetime careers for bureaucrats." Most of the basic facts presented by Massie matched those in an overview of salaries and expenses issued in 2016 by the Department. That report listed 4,328 full-time employees. However, the suggestion that those employees are all working out of the national headquarters in Washington was wrong. Many of the jobs are in 11 regional offices and 13 field offices located all over the country. According to the report, the division with the largest employee count (1,247 employees in 2015) was federal student aid, staffed by people primarily charged with reviewing lenders, institutions and guaranty agencies participating in student financial aid programs, as well as performing debt collection activities on defaulted student loans. The next largest office is civil rights, which had 554 people in 2015, charged with investigating civil rights complaints and performing civil rights compliance reviews. That was followed by elementary and secondary education with 244 people, and the office of the inspector general with 241 people, who conduct audits and inquiries of department programs and operations. The smallest office is the National Board for Education Sciences, staffed by a lone individual. This isn't the first time ED has faced its demise. The department was originally founded in 1979, under the "Department of Education Organization Act," signed into law by President Jimmy Carter. Just two years later, President Ronald Reagan proposed dismantling the department. "Education is the principal responsibility of local school systems, teachers, parents, citizen boards and state governments," Reagan said in an address to the country. "By eliminating the Department of Education less than two years after it was created, we cannot only reduce the budget but ensure that local needs and preferences, rather than the wishes of Washington, determine the education of our children." However, Massie's proposal is unlikely to make it out of committee because it's just "posturing," suggested David Schoenbrod, a professor at New York Law School and the author of several books about Congress' role in crafting law and regulation, in an interview with NPR. The problem with the bill: It doesn't specify what would happen with ED's $68 billion annual budget or the department's various functions, such as civil rights enforcements or oversight of student aid. The timing of the bill is also problematic. 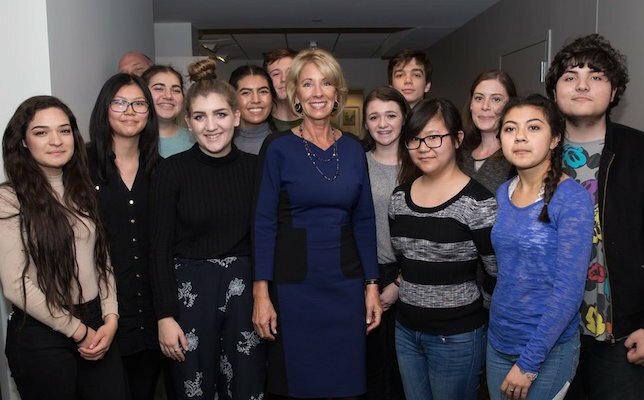 In her first staff meeting earlier this week, DeVos thanked employees "here in the Department and those across the country who work every day to make education better." She concluded her speech, "It's day one for me, but it is simply the next day in this department's history to pursue its mission. I'm ready to work with you. Let's get started!"